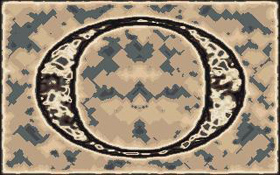 An example of the abstract imagery created by the Bomb visual-musical instrument. This is reaction-diffusion running in real time and interacting with imagery of Chinese writing. Bomb projected during a live VJ performance by "Yetimon" in New Zealand. Bomb was widely used by VJs, including the first VJ performances at Burning Man in 2000. 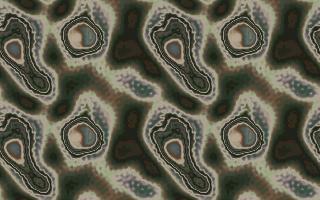 More reaction-diffusion running in realtime. 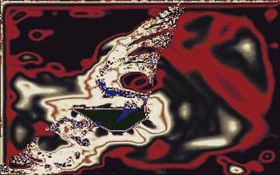 An example of the abstract imagery created by the Bomb visual-musical instrument. In this case a realtime and audio-reactive flame algorithm, combined with cellular automata. An example of the abstract imagery created by the Bomb visual-musical instrument. 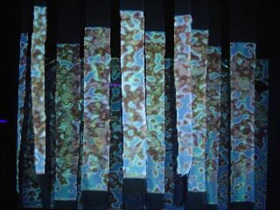 Scott Draves' 1995-2000 Bomb software is a visual-musical instrument that produces animated organic graphics on its own or interactively, and responding to music. Bomb was awarded the Prix du Public at Life/Vida 2.0, Madrid in 1999 and at BIT.Movie, Riccione Italy in 1996. 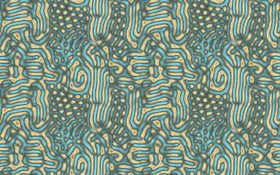 It is notable that Bomb was the first realtime and interactive realization of Turing's reaction-diffusion model of morphogenesis, a technique which has now become popular. Like Draves' this program is open source, which means that other artists may build upon it to create their own artwork. It was widely used including by VJs at the legendary Chicago nightclub Shelter and the first digital projections at Burning Man 2000-2005. But I suspect that most people experienced it solo or with friends on their regular computer, for fun, meditation, and other performances for one. It was also incorporated into conceptual and technical collaborations with Nell Tenhaaf, Kim Cascone, Roger Dannenberg, David Zicarelli.